I am pretty excited, and not because it is Friday. Ok well, I am definitely pretty excited it is Friday, but I’m more exited about sharing these poptarts with you. They have been on my “list” since way back in February when I tried to make them and failed. It was a failure that was so bad it took me a good seven months to muster up the courage to try them again. Don’t you just love how dramatic I am? I swear, everyday I write this blog I become more and more dramatic. What’s the deal? Honestly, I was never this dramatic growing up. Err, ok fine. That’s probably a lie. I am sure if you asked my mom or my dad they both would tell you a different story, but I was their only girl, so really what do they know about dramatic girls? I made it is easy for them. Now Asher? Yeah, let’s just say I am going to look like and angel (and trust me, I was not). The girl is the definition of dramatic. Yikes. Anyway, I tried to make these in February and they just were not right. Too big, too much filling and too soft. Almost brownie like, which was really good, I mean they all got eaten within a day or so, but they weren’t poptart-like. They were not like these. Unless of course the incredible and amazing royal icing and cookie decorating queen, Bridget wants to come and give me a lesson. Yeah, then I think I could give you guys a much prettier poptart, but for now these will have to do. My mom did not buy many boxes of poptarts growing up, but when she did it would always be the chocolate fudge. I think is was one of the only junk foods I really liked. I was always an oddly healthy eater. Think whole grain turkey sandwich and carrots for lunch and raw broccoli and more carrots after school. Oh, and I always ate my vegetables at dinner. I am telling you, I was odd. But I did like the chocolate fudge poptarts. I mean, what is not to like? It’s a chocolate pie crust filled with chocolate fudge. They were the perfect treat every once in a while when on the rare occasion my mom did not have a pan of homemade cookies lying around. They are pretty easy to make too, which is always nice. And seriously, don’t worry about making them perfect. It will drive you insane. Unless you’re a cookie decorating pro I just would not worry about it. My only note is to make sure you seal the dough together really well. I have no idea why, but for some reason I used my fingers to seal most of the poptarts. It worked, but I definitely had a few ooze out some of that awesome fudge filling. So be smarter than I was and use a fork to crimp the edges together. Oh, and even more importantly – do not try putting the frosted poptarts in the toaster. It does not work, I know from experience…..
Yeah, my brain was in an “oh my gosh, I need more fudge poptarts in my life” state and totally did not think clearly. However, if you want to be able to simply pop them in the toaster, skip the frosting. The unfrosted poptarts work great in the toaster! A homemade version of a family favorite! Start by making the fudge filling. Stir together cocoa powder, brown sugar, milk or cream, salt and half of the chopped milk chocolate. Place in a small sauce pan and cook over medium heat, stirring, until chocolate is melted. Cook mixture at a low boil, stirring occasionally for 5 minutes. Remove pan from heat, add remaining chocolate, butter and vanilla and stir until smooth. Set aside to cool and thicken. Preheat the oven to 400 degrees F. Line baking sheets with parchment paper or silicone baking mats. In a large mixing bowl, combine the flour, cocoa powder, sugar and salt. Add chunks of the butter and mix with a pastry blender or your fingers until the mixture is crumbly. Gradually add the water until the mixture is moistened and a dough forms. Place the dough in between two large sheets of parchment paper or on a lightly floured surface and roll out into an 1/8-inch thickness, using the parchment paper or working on a lightly floured surface. Cut the dough into rectangles, about 6 1/2 x 4 1/2 inches. Place a heaping tablespoon of filling on one half of the rectangle. Lay the other half of the dough over the filling and seal the edges by crimping with the back of a fork. Repeat until all the dough has been used, saving the scraps and re-rolling to make more rectangles. While the poptarts cool make the frosting. In the bowl of stand mixer, mix the powdered sugar, meringue powder, vanilla, cocoa powder and 3 tablespoons water for about 7-10 minutes on medium speed, until peaks begin to form. Stir in the melted chocolate. 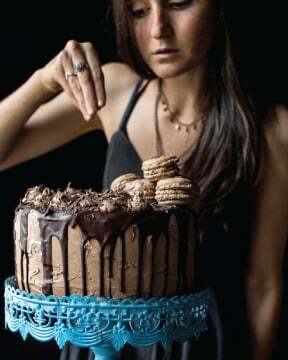 If your frosting seams too thick, thin as needed for outlining or flooding by adding more water. I found 5 tablespoons of water was good. Spoon a thin layer of the frosting on top of cooled poptarts. Allow frosting to harden 10 minutes and then if desired sprinkle with, course salt or course, sugar. Place on a baking sheet and allow the tart to harden uncovered, about 2 hours. 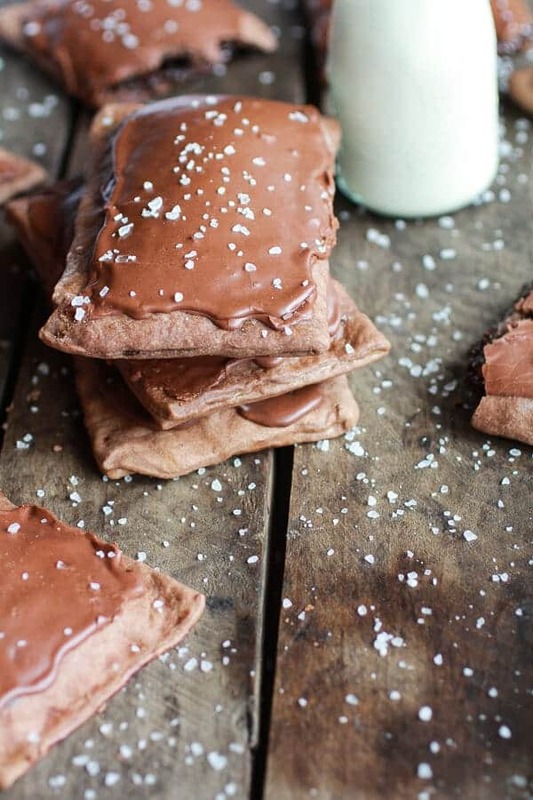 Homemade Chocolate Peanut Butter Fudge Pop-Tarts. 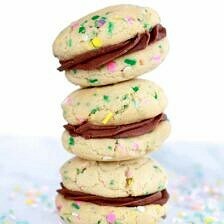 Homemade Funfetti Sandwich Cookies with Chocolate Ganache Frosting. 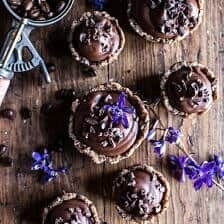 Mini Vegan No-Bake Chocolate Mocha Fudge and Coconut Tarts. SERIOUSLY?! I feel like I get this excited about every single thing you make, but seriously?!?!!? These look unreal. Haha! Yes, that is my goal! LOL! Thanks Jammie! Have a great weekend! I can’t even tell you how good they look, how creative they are, and that these things are going to BLOW UP!! You deserve it! The dough itself (hard to make cocoa powder in dough not just get overly crumbly) and then the filling!!! and the frosting! Omg Tieghan!!! wow! Averie, you are so sweet! Thank you! The filling is my very favorite part! I could eat it with a spoon! 50 please. At least. Maybe 100? You know what, send 50 – I’ll let you know if I need more. Actually no, send the full 100. Kthnxbai. I want to make these and hide the whole batch in my closet. Seriously, pretty sure you NAILED IT. Looks fantastic!! Thank you, Sopie! Oh and hiding them is a good idea. They go fast! A chocolate lover’s dream breakfast. They look amazing! Way better than the store bought ones! Oh I hope you guys love these!! Thanks so much, Kim! LOL! Thank you, Dara! I wish my family was that impressed…I think they are just used to it! Oh and I know what you mean, I cannot do these for breakfast either. They are more of a dessert in my eyes! These look wow good!! Love your photos! Definitely love starting my day out with chocolate. Thank you so much!! Chocolate is never a bad way to start the day! Have a great weekend, Jaclyn! 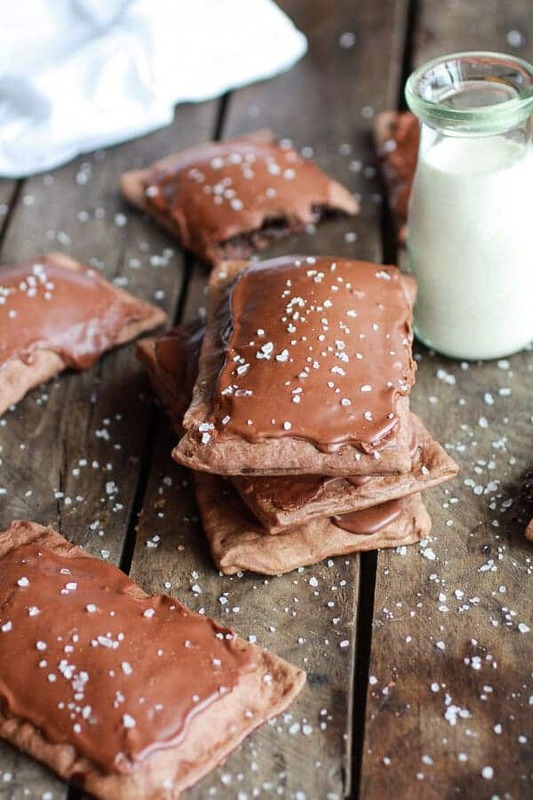 Homemade poptarts sound like so much fun to make! 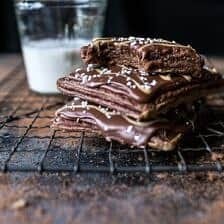 These look incredible, unfortunately I’m not sure I should share this recipe with my kids, I’m afraid after this they will not settle for anything else!! Great post! Haha! Thanks so much, Dan!! I think these look absolutely perfect! Love the idea of putting salt on the top. I bet these are way, way better than store bought! Thank you so much, Leah! They totally are! Oh. My. Gosh. YES. I haven’t had a poptart in a bazillion years and I need to change that ASAP, starting with these babies! Yes, you need a poptart ASAP! You are way overdo! LOL! Oh and I like the word rustic. That just sounds nice! Thanks Cindy! Wowza, these look amazing! 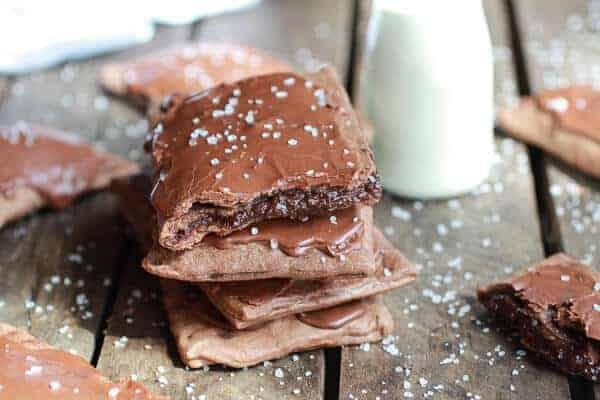 I’ve never made a homemade pop tart (and have only tried bites of the store bought ones–again, I didn’t have those growing up either, are we the same person? haha), but OF COURSE, these would be about a million times better. 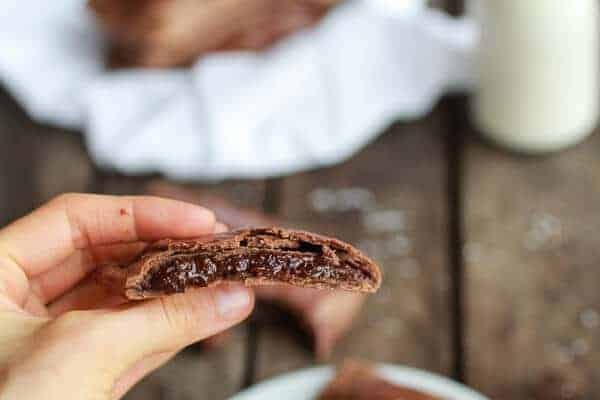 Love the gooey, fudgy filling too. And salt finish! The fudge in the middle is the BEST part. Oh my gosh so good!! I could eat it with a spoon. Seriously! LOL! Thank you, Christine! Happy Friday to you too! Oh why did you do this to me?!!!! Gawd I want one, or two, or three, so BAD! So sorry! I wish I could send you some I really do, but….they were gone in like a minute! Thank you so much, Marla!! Holy cow! Yes! I never really had pop tarts growing up, but these make me wanna change that right away! Oh my – wow. Those look crazy amazing. I think your pictures are INCREDIBLE and they make me want to try this asap. That filling, that crust – like I said, just wow. OMG heaven on a plate! I love, love, love pop tarts! Been meaning to attempt my own for ages, these are making me want to make them even more! 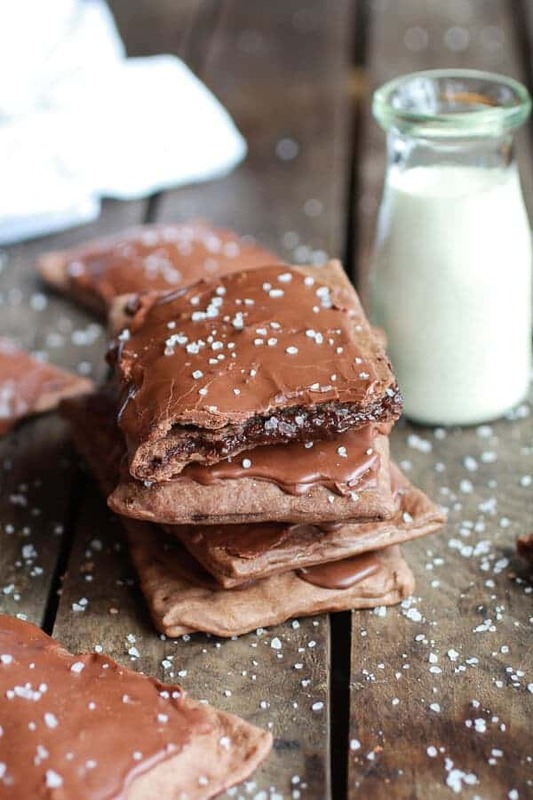 Alright, I’m calling it: homemade poptarts are the new cake pops. BOOM. Haha! Yes, I love it!! Best Friday post ever! I love pop-tarts! I’ve made them at home before and I too tried putting them in the toaster–never again. I find that just resting them on top of the toaster , icing side up, they get nice and warm without making a mess! Ah!! That is a great idea!! 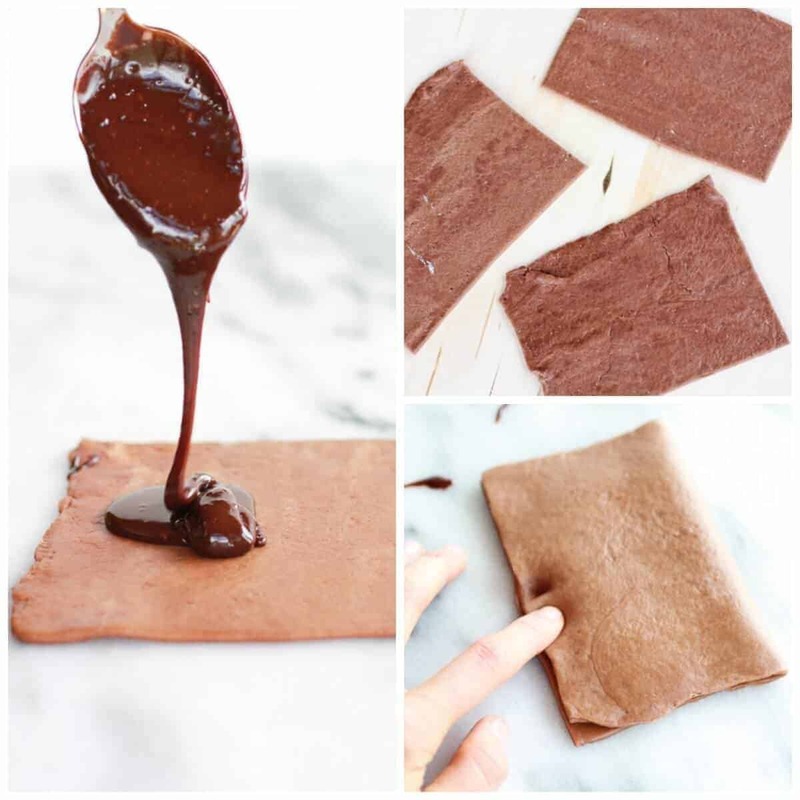 These are seriously blowing my mind right now–can’t wait to try making them! Thank you so much, Anna! I hope you love them! I’m a weird healthy eater, too. I’ve never had a Poptart ever. Not like that is a travesty. ha. But these look so yummy! And they aren’t like store-bought Poptarts which are filled with junk and fake ingredients. 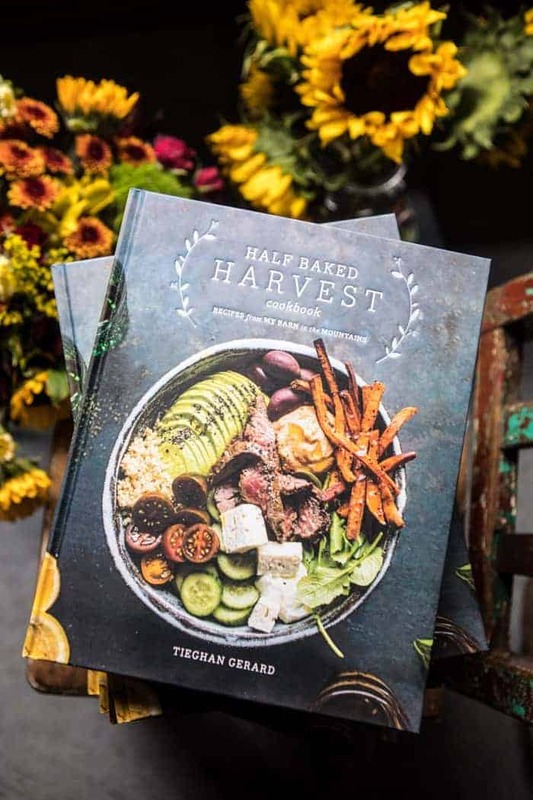 You really outdid yourself this time Tieghan! These look crazy dangerous…you’re so talented. Thank you so much!! You are so nice! So funny, I’ve been working on poptarts for the last 3 weeks and JUST got a batch I liked yesterday. But um, there’s no way mine are going to look as good as these beauties… they’re incredible, T!!! Oh please!! I bet yours are insanely amazing!! They are going to look great and I cannot wait to see them!! 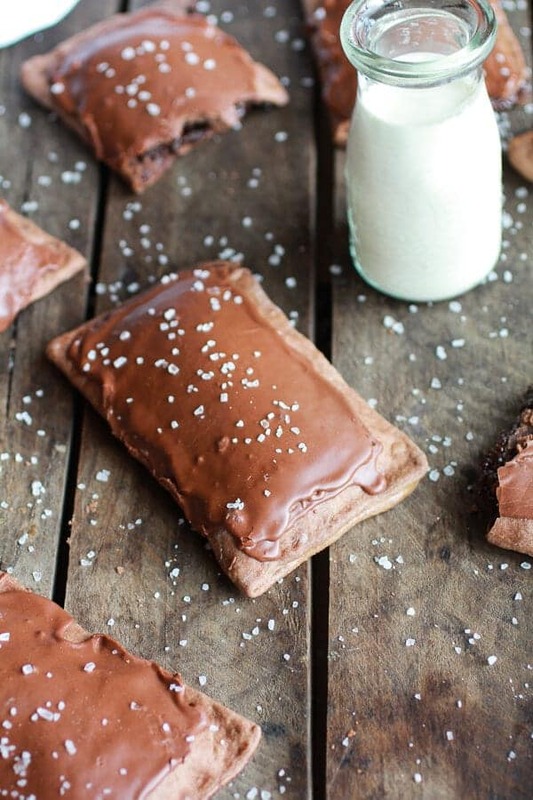 I didn’t really like poptarts as a kid, but I never had these… fudge brownie poptarts?!?! Amazing. Awe, thank you!! Your are the best! Oh and your brown butter pear bars? Heck yes! I’m speechless! WOW. These take the poptart cake! O.M.G. this is bonkers. LOVE! Hehe! Thank you so much, Laurie!! Wish I could send you a batch! Thanks you so much, Julia! I am so happy you stopped bye! Oh hope you guys love these! Thanks Jenn! 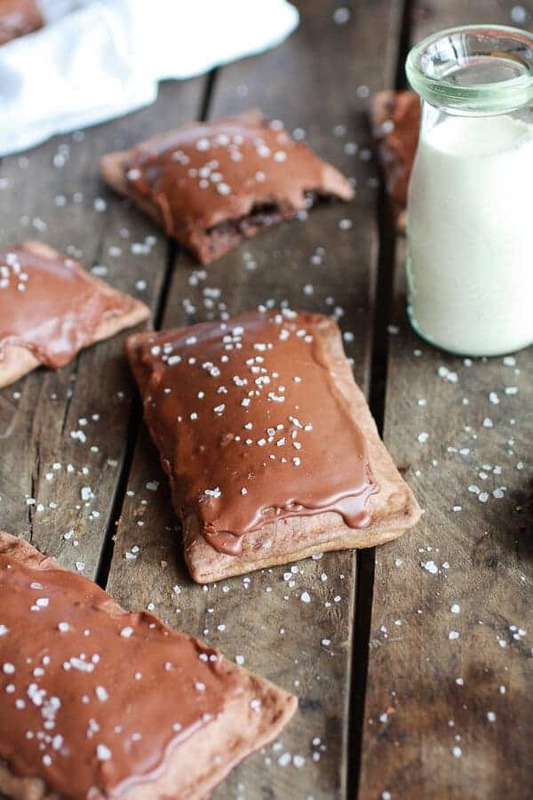 Homemade pop tarts sound like the best thing to wake up to! Especially Chocolate fudge!! Thank you, Gaby!! The chocolate fudge filling the the best! I just made them and they are very dry. Is there something you can suggest in helping me make mine more like yours. I realize I didn’t make them as thin as you but this is my first time making any kind of pastry. The frosting was awesome. The filling my family did not like but they don’t like dark chocolate so I am going to use chocolate only next time. Thank you so much for posting this I enjoyed the experience as I am new to cooking. Mine were not dry at all, but it has been very moist were I live lately so I am sure that helped. To help moisten the crust add one tablespoon of water at a time until the dough feels moist and form a solid ball. Then roll the dough out between two sheets of parchment or wax paper with a little flour as possible. Just use enough flour to keep the dough from sticking. This should help a ton and I hope it works so much better for you! As for the fudge filling, I cannot believe your family did not like it! Whoa! Try it with all milk chocolate this time, hopefully that should do the trick! Glade you did like the frosting though! Thanks so much for making these and I hope your second batch turns out better for you!! I had the same issue as Amy. We found the dough really difficult to form and to roll out. We ended up adding quite a bit of water, one tbsp at a time just to get it to hold together. Once baked, the dough seemed off. The filling was phenomenal, but the dough was kind of dry and bland. Any thoughts? Need to share these on the next friday links! Oh yeah! So happy you loved these! Thanks so much for making them! Ahhh my gosh Tiegan! KILLING ME! I’ve probably had pop tarts about twice in my life because my mom never bought them, and even though I probably wouldn’t like the “real ones” much now if I tried them, I still crave the taste I imagine/remember in my head. These look spot-on perfect. They’re on my list to make for sure! Thank you!! But really, those cookies you made are KILLING ME!! Love them! Seeing the photo made me click because they look just like the real thing, only better. The only pop-tart that I eat is the Chocolate. Can hardly wait to make these, or should I say, my daughter will probably be the one because she’s the baking queen in our house. Can’t wait to try the chocolatey goodness. I bet I could eat the filling and frosting up with a spoon also! Oh my!! Thanks so sharing. The filling is the best part! SO good and I could totally eat it with a spoon! Thanks so much for clicking over and I hope you guys love these! These look great! Very pumped to try! Question: Approx. how long does these stay fresh? Mine were gone within three day, but I bet they last a least a week at room temp! These look so good. I am now craving them indefinitely. Thank you so much, Shaina! I wish I still had some left. Looking through the pictures and not having them was kind of like torture! LOL! OMGoodness! My kiddo is going to love these!!!!!! HA! Thanks Chrystal! Hope you guys both love them! Amazing pictures! I am drooling over these poptarts. You are a DOLL! There are my husband’s favorite flavor. I’d rather make them myself than buy and figured I’d have to discover out my own recipe. 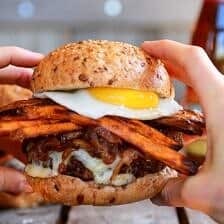 I discovered yours on Tastespotting and couldn’t believe my eyes. He’s going to have to fight the kiddos on these. I can’t wait to try them out. HAha! I am so happy you found this recipe! Hope your whole family loves these! 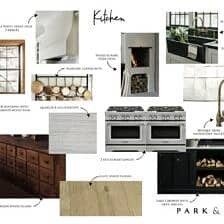 Found your blog through pinterest and I must say this looks amazing. I definitely plan on making them. I cannot imagine they will last very long but I was wondering if you have any storage suggestions. I have never made homemade pop-tarts ( I have seen some recipes for strawberry ones but I think I have been holding out for a fudge recipe) so I do not really what would be best. Hi Katharine! So happy you found my blog and these poptarts! I stored mine in a sealed container in a single layer and they lasted over week (I made over three batches so I had so many). Not sure if they would last longer in the fridge, but you could try that too! Umm…..these look amazing. I request a DIY strawberry poptart though please. Thank you and I will keep that in mind! Okay- I admit that they’re not the ‘prettiest’, but that’s the best part! They’re obviously homemade and that’s what’s so great! You wouldn’t want them to all come out so uniform that they lose that rustic touch that tells you they weren’t made in a massive factory by some automated system! Homemade is the way to go- and I’m sure it’s much, much cheaper! But those chocolate fudge poptarts are a weakness of mine sometimes. I don’t care for the edges that aren’t covered in the frosting or stuffed with filling (they get kind of dry and boring) but yours don’t look like they’d be boring at all!! I’m anxious to try these next poptart craving! 😉 Thank you for sharing! Thank you so much, Jolene! I hope you love these! WHOA. Just whoa. I mean, honestly… I think you’re a genius. I have to make these ASAP. They look so yummy! I’d like to make them and that frosting too, but I’m afraid I will not find meringue powder where I live. Is there any replacement I can use? HI! The meringue powder can be bought here on Amazon or you could try subbing 1 egg white. Hope this helps and I hope you love these!! Let me know if you have any more questions, thanks! Yumm.. better give it a try! Soooooooonn.. Thank you! Thank you! Thank you! 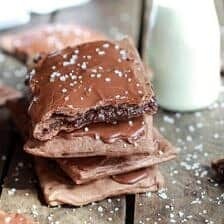 I have been working on finding homemade versions of goodies usually bought at the store, which pop tarts were on that list. While I have found some recipes for pop tarts none were for my sons favorite type of pop tart that is until now. You are one of my new online foodie heroes. I am looking forward to finding out what other yummies you have created. Thank you again. Oh my gosh, thank you!!! Hope you love these!! So happy to find these, yum! 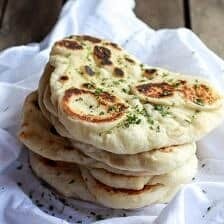 Has anyone tried making these with an all purpose gluten free flour or other non-wheat flour? Could they be maybe warmed up for a short time in the mircowave since the toaster is out? Maybe a toaster oven? Thanks Kisa! These can be warmed in the microwave or toasted oven, but depending on how long you let them go for the frosting may get a bit melty. 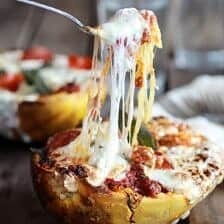 Do you think these could be made and then frozen? I don’t foresee myself doing all this when I want a pop tart, but if I can freeze them then take one out the night before that’s a different story! Yup! I think that would work great! Hope you love these. Thanks Ashley! OMG I am SO SO SO excited by this ! Definitely trying ! Thanks Leslie! Hope you love these! Seriously, what kind of soucery is this??? This most be the best recipe ever!!!! Thank you for make my day for let me know this is possible, and for share this amazing recipe. Thank you!! Hope you love these! can i substitute meringue powder with something else?? HI! Try using 1 egg white. Will that work for you!? Could you substitute almond or cashew milk for the cow’s milk? Hmm, I am not sure since I have not personally tried it, but I think it would work. Let me know how it goes. Hope you love them!! I just finished making these and they were awesome. The filling is great by itself. I sat and licked the bowl clean while they were baking. I didn’t make the icing for the top though because I had a lot of filling left over. I accidentally rolled the dough a bit too thick but I poured the leftover filling over the top and they were fine. I didn’t have any problems with the dough at all. I saw others commented their dough was dry but mine was great. I put all the ingredients in the food processor and the dough mixed up in a few minutes. I added water tsp by tsp instead of just adding 1/2 cup like the recipe. I might have put more than 1/2 cup in it. I recommend for others just add ice water 1 tsp at a time until it is moist enough it doesn’t crack. These poptarts were really tasty and I’ll definitely make these again. Once they cooled I put half of them in some freezer bags in packs of 2 and froze them. I don’t know how they’ll be after being frozen but I’m hoping they’ll be fine. They’ll be a nice chocolate fix for a rainy day. Hi, these look great and I can’t wait to make them but I’m having some trouble with the measurements as I’m from England and we generally work in grams and ounces. Would be great if someone could help me, I’m absolutely dying to make these! Pastry: 420 g flour, 14 g cocoa, 12 g sugar, 170g butter, 120 ml water. I used a teaspoonfor the salt, because it’s such a small amount. Filling: 30 g cocoa, 72 g brown sugar, 160 ml milk or cream, 168 g chocolate (I used Callebaut 35%), 28 g butter. Again, salt and vanilla were measured with a spoon. And Tieghan, thank you so much for this recipe. I love it! Wow, thanks Julia!! That is very helpful! Thank you so much for those conversions that’s jolly good!! These look amazing!! Could you tell me what kind of sugar you’ve used on top of the pastries? Thanks in advance!! I use sweadish pearl sugar. Here is the link. Can’t seem to find maringue power where I live (Thailand). Any substitution? HI! You can just leave the it out. The frosting with not be as glossy as in the photos, but it will still be great! I tried these, and they were so yummy! The recipe worked out really well, but the dough was just a little bit dry. Anyways, I just love the fact that somehow you find a way to reply to just about every comment on here. Thanks! Hehe! SO happy you loved these!! THANKS!! Hi! I live in Ecuador and we cannot get poptarts here. My kids jumped for joy when i ound your recicpe! I just tried my hand at these with half hearted results though! Filling is awesome but had many of the same issue with the pastry, just didnt come out chocolaty enough. 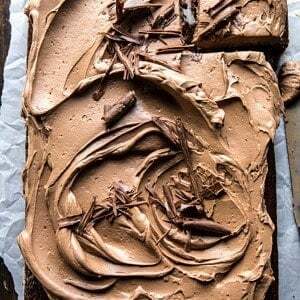 Do you think I can add more cocoa powder ( as i said..I live i Ecuador, land of chococlate but it seems the cocoa powder I used is not as potent!) The boys of the house had no complaints though! I am glad i discovered your blog! I have a theory regarding the differences in results between people. After trying the recipe myself i also found the dough to be horrendously dry. Living just a few hours from the coast in a fairly humid environment i found it impossible that the air could be drier than Colorado. But CO does have a very high elevation and i know elevation does things to baked goods so maybe that’s the cause of the discrepancy. Anyway with a bit of research i was able to tweak the recipe for us ‘dry dough’ folk and it came out phenomenally. All it took was 1 egg blended together with 3 Tbsp milk to make the dough malleable. I also had a splash of vegetable oil from before i thought to add the egg, so 1-2 tsps of it won’t hurt anything. Due to comments that the dough was bland i also added another 1 Tbsp of cocoa powder, and about an even amount of sugar and cocoa mix. Note that the dough was still only lightly flavored and semi-sweet. If you want it more like the stuff at the store you’ll need a lot more chocolate and sugar, maybe even going so far as to melt down some chocolate chips. Thanks for the recipe. It was a lot of work but totally worth all the effort. These are so helpful! Very happy you love the recipe, thank you again! The concept of a homemade pop tart was intriguing. But for me, these were far more trouble than they were worth. While the filling on its own was good enough to be eaten with a spoon, I did not find that the overall end product was tasty enough to justify the amount of time and effort it took. I had high hopes, but I still prefer the store bought variety. Thank you in any case for sharing a recipe that you’re excited about with all of us. Perhaps others will enjoy it more than I did. Ah bummer it wasn’t what you were expecting. Sorry about that Gina! Thanks for trying anyway! Can you clarify how much butter you put in the dough part? It says 1 1/2 cup sticks… is it 1 1/2 sticks or 1 and 1/2 cups? Thank you so much Valerie! I am so glad you loved this recipe! The dough needed way more than 1/2 cup of water to come together and it was very hard to roll and handle once I finished adding liquid. I rolled the dough out to 1/8 of an inch but it took more than 10 minutes to cook in the oven. The filling is yummy but the flavor of the crust isn’t that nice. Hi Sachika! I am sorry to hear that this did not work for you. I hope you enjoy some other recipes on my blog! Thank you! I haven’t tired you recipe yet however while reading it feels like 3/4 cup butter is not enough for 3 1/2 cup flour. I guess you meant to say 1 1/2 cup butter and not sticks. That will also explain the dry texture people have issues with. A typical pie crust uses 1 cup flour to 1/2 cup or 1/3 cup butter.